Sure, compute is useful. 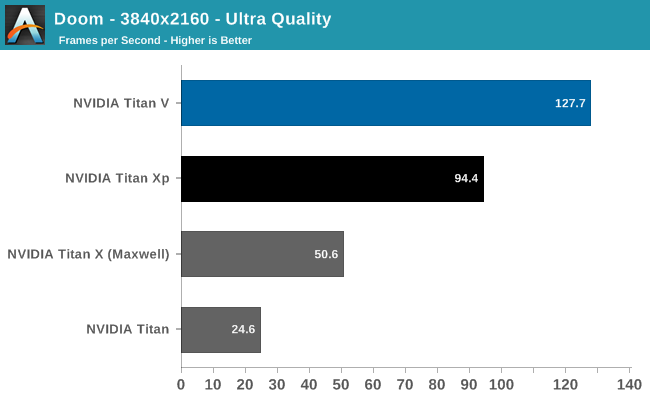 But be honest: you came here for the 4K gaming benchmarks, right? 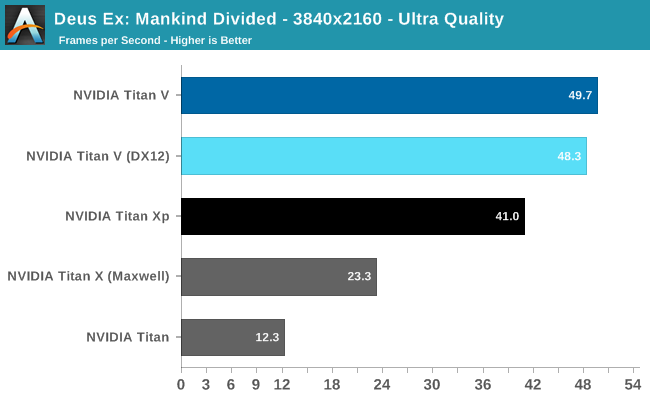 Already after Battlefield 1 (DX11) and Ashes (DX12), we can see that Titan V is not a monster gaming card, though it still is faster than Titan Xp. 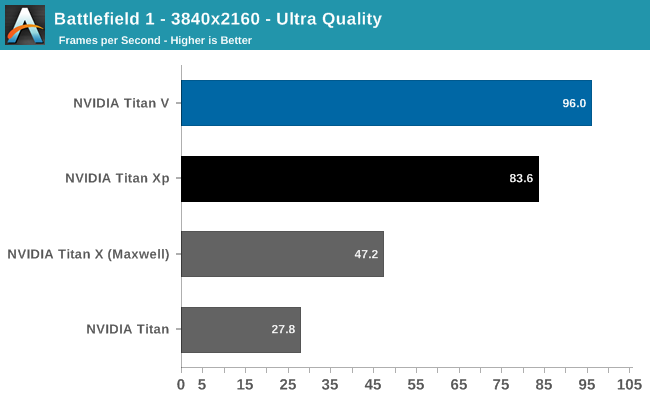 This is not unexpected, as Titan V's focus is quite far away from gaming as opposed to the focus of the previous Titan cards. Despite being generally ahead of Titan Xp, it's clear Titan V is suffering from lack of gaming optimization. And for that matter, the launch drivers definitely have bugs in them as far as gaming is concerned. 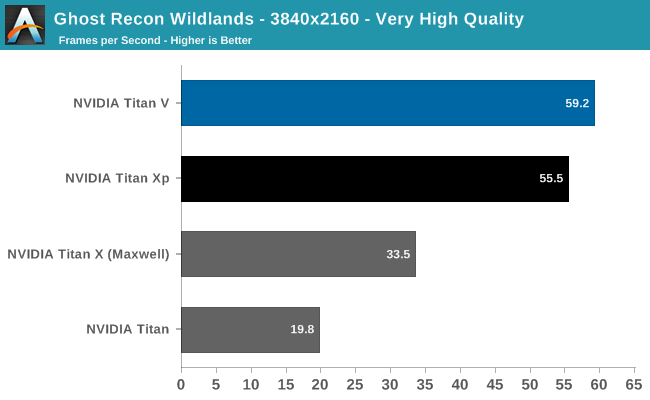 Titan V on Deus Ex resulted in small black box artifacts during the benchmark; Ghost Recon Wildlands experienced sporadic but persistant hitching, and Ashes occasionally suffered from fullscreen flickering. And despite the impressive 3-digit FPS in the Vulkan-powered DOOM, the card actually falls behind Titan Xp in 99th percentile framerates. For such high average framerates, even a 67fps 99th percentile can reduce perceived smoothness. 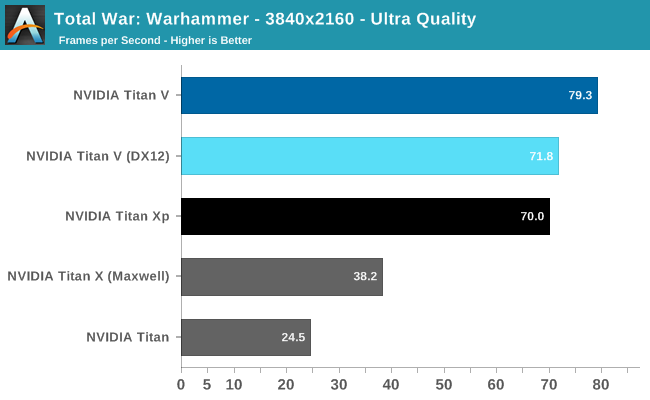 Meanwhile, running Titan V under DX12 for Deus Ex and Total War: Warhammer resulted in less performance. But with immature gaming drivers, it is too early to say if these are representative of low-level API performance on Volta itself. 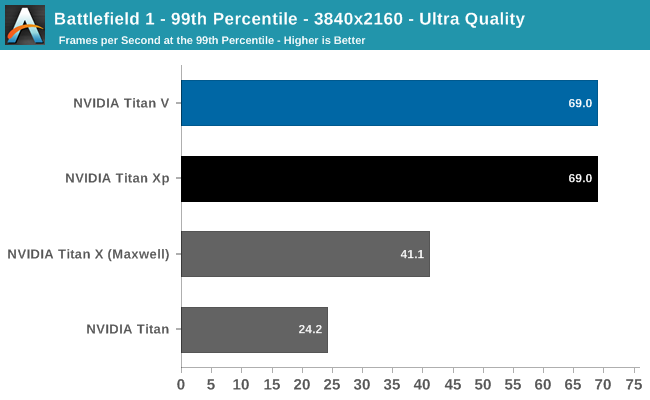 Overall, the Titan V averages out to around 15% faster than the Titan Xp, excluding 99th percentiles, but with the aforementioned caveats. 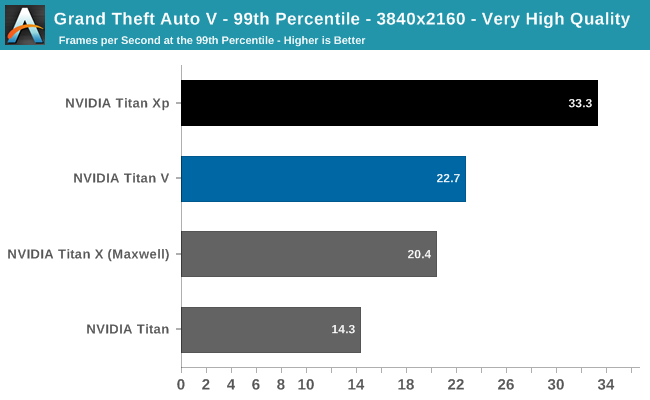 Titan V's high average FPS in DOOM and Deus Ex are somewhat marred by stagnant 99th percentiles and minor but noticable artifacting, respectively. So as a pure gaming card, our preview results indicate that this would not the best gaming purchase at $3000. 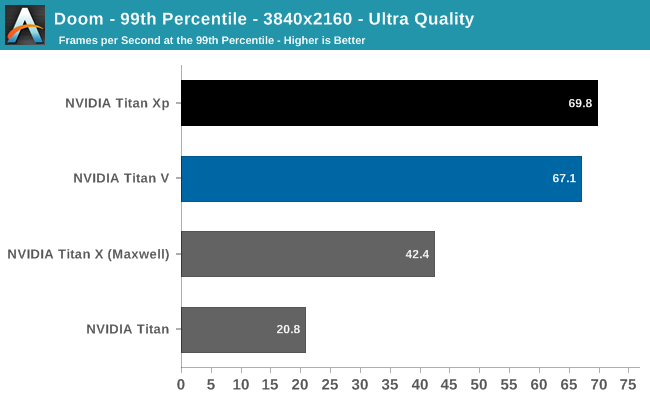 Typically, a $1800 premium for around 10 - 20% faster gaming over the Titan Xp wouldn't be enticing, but it seems there are always some who insist.